At French for Life I’m passionate about sharing the real culture, history and experience of France with all of my students. No matter whether you are an adult learner that is just starting or someone who has been learning the language for several years and now wants to refine and improve their skills, our diverse range of courses, workshops and travel tours can help you reach your language goals. This course provides a general introduction to the language for students who are just beginning their journey into the French language, and is ideal for anyone who is considering travelling or who just wants to gain a basic understanding and appreciation of the French language. Our beginner classes provide the perfect environment for new students to gain the confidence and support needed to help you enjoy this wonderful language, while also appreciating the French culture and have you speaking basic phrases in little to no time! 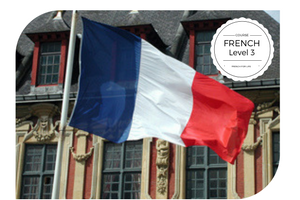 So even if you just know a few words or you are complete beginner, Level 1 is the perfect place for you begin your French journey. It will not only give you the confidence and foundation in which to explore and develop your understanding of the language, but it will also provide you with the confidence to start using useful key phrases and vocabulary from your very first lesson. Continuing from French Level 1, this course provides participants with further development their foundation language skills. It provides the perfect platform for students to be able to communicate and use their knowledge and understanding of French in a wider arena of both social and formal situations. In Level 2, you will enhance your understanding of grammar, vocabulary and fluency which will enable you to have more enriching and vibrant social conversations. You will also gain a greater awareness of the language including the use of verbs, sentence structure and the use of past and present tense. The aim of our French Level 3 classes is to help or students develop greater proficiency in both spoken and written French at an advanced level, and in a wider range of contexts. It will also help you to expand your knowledge of French culture, history and society and help enhance your overall intercultural understanding. In these classes you will develop advanced linguistic accuracy, complexity, flexibility and fluency in your vocabulary, structures and texts. Additionally, you will gain effective strategies for spoken and written communication and being able to appreciate a greater variety of cultural texts and situations.